The Dreaded Winter Daily Chore! Snow shoveling seems like a daily chore these days, but it’s important to do it correctly and carefully to avoid injury or even death! The two biggest risks of shoveling are back injuries and heart attacks. In 2007, over 118,000 people were treated for injuries related to snow shoveling, according to the U.S. Consumer Products Safety Commission. More than 16,000 were injured using snow blowers with injuries ranging from sprains to lacerations or finger amputations. Shoveling snow is hard work- there are hundreds of pounds out there in our yards and driveways! Moving all that snow at one time can cause a heart attack. The heart is a muscle like any other in your body and when it gets strained, it can shut down because it can’t handle the increased load. Older adults who are not active, can overtax their cardiovascular system when they start shoveling and this can result in a heart attack. Warm up. Cold, tight muscles are prone to injury. Warm-up for 5 minutes by jogging in place and stretch your back and arms to get your muscles warmed up. Pick the right shovel. Select an ergonomic shovel that is lighter with a contoured and adjustable handle designed to reduce back bending and decrease lifting. Stay steady. Wear good boots with tread to avoid slipping and falling to stay steady while shoveling and if necessary spread additional salt or sand to increase traction. Use proper shoveling technique. Push the snow instead of lifting it, and be sure not to overload the shovel. If you have to lift, bend your knees and lift with your legs (not your back!) and avoid twisting or throwing snow. Pace Yourself. Shoveling small amounts of snow frequently is less strenuous than shoveling one large pile. If the snow is deep, remove the top few inches at a time. Take breaks. Every 15 minutes or so, stand up straight, walk around and stretch, and drink water to avoid dehydration and overheating. Listen to your body. Pay attention to your body’s signals, such as pains, shortness of breath, or chest discomfort and stop shoveling if necessary- call 911 if you think you are having a heart attack. Try a snowblower. Used correctly, this can lessen the stress on your back and move a lot of snow quickly. Use your legs to push it while keeping your back straight and knees bent. Don’t shovel. Some people should ditch shoveling duties! If you are over 50, out of shape or have a history of a heart condition then plan to have someone else do it for you. 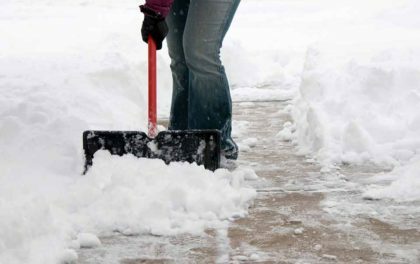 For those who are fit enough to shovel you can get quite a workout doing it and burn up to 400 calories per hour along with winning the best neighbor award for helping out others. But be careful with all this extra work by following the above safety precautions to ensure you have a happier winter season and active spring to come!